ROS-W Remote Optical Sensor 8 foot cable, mounting bracket and 12 inches of reflective tape Reliability Direct, Inc. Your Direct Source for Reliability, Maintenance, Test & Measurement! 1-250,000 RPM. Ideal for most applications up to 36" from reflective tape target. 8 foot cable. The most versatile and popular sensors we make. 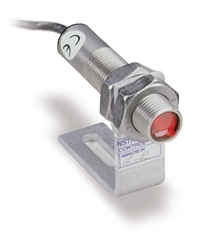 The ROS-P is a threaded stainless steel remote optical sensor with a visible red LED light source. The sensor has an "on-target" green LED indicator.